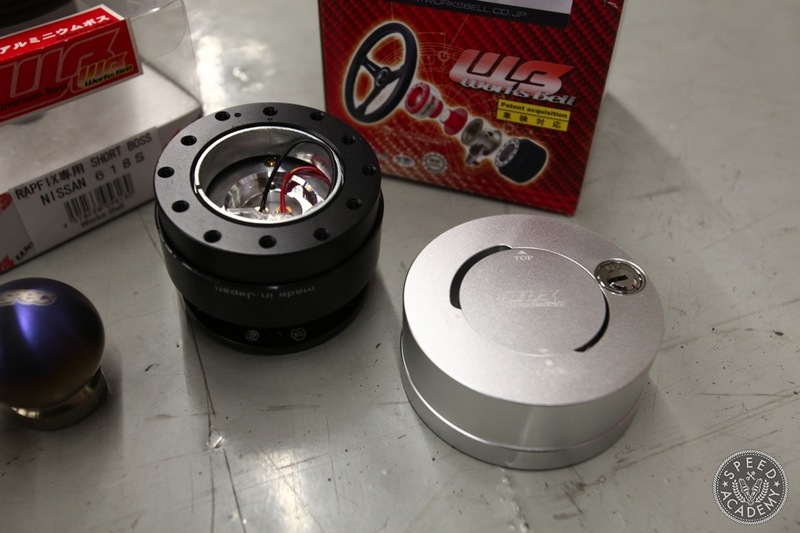 There are several reasons to replace a stock steering wheel with an aftermarket unit. One of the most popular being, the aftermarket one reduces the overall diameter of wheel allowing for less input and thus quicker steering. 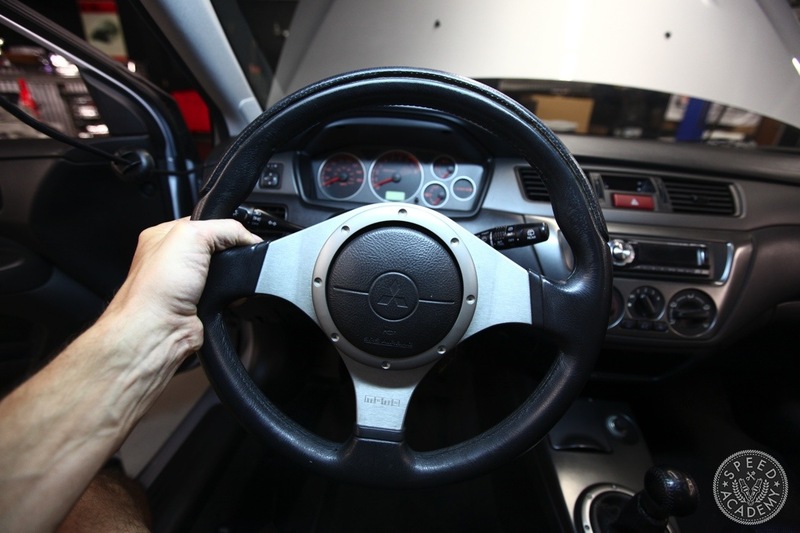 Cosmetically, aftermarket steering wheels look more aggressive so it’s no reason why so many enthusiasts swap them out but looks aside, there are more functional reasons. If you’ve installed 4, 5 or 6-point harness belts and are racing on the track then it’s common practice to disable the steering wheel airbag since a 3-point belt is meant to give and provide some forward motion so that you meet the airbag as a supplemental restraint. 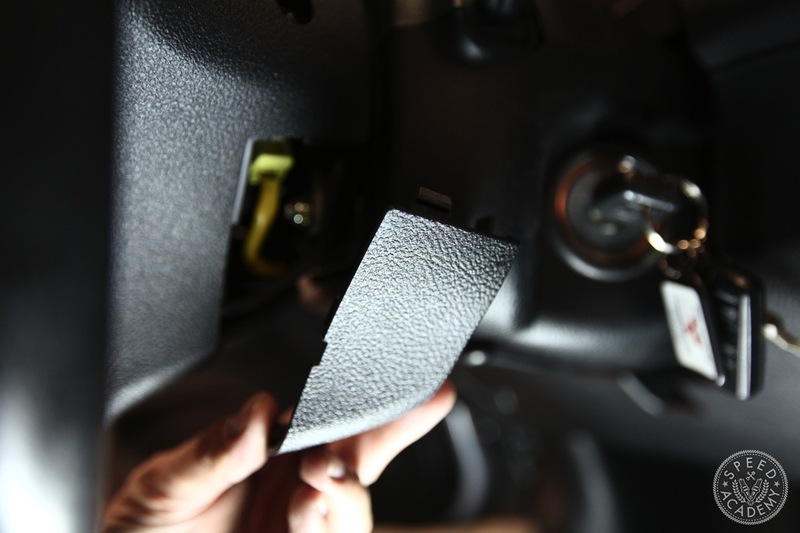 The harness doesn’t allow for much movement which negates the airbag’s purpose. Plus, it’s not going to explode in your face during an off-road excursion and we all know how important it is to be able to steer when you’re trying to minimize damage after a miscalculated turn or spin. If you’re adding a quick release hub setup, that too has its advantages. 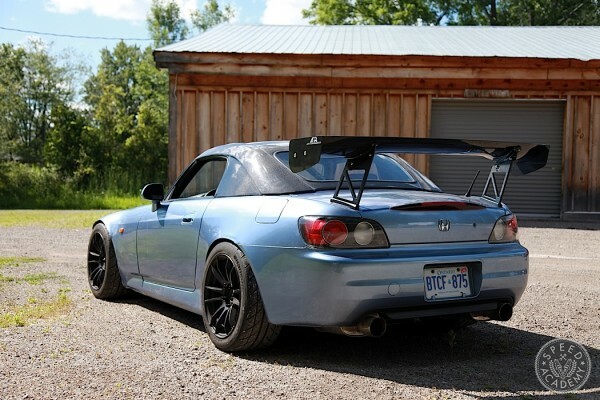 Getting in and out of a car with a roll cage is a lot easier when the wheel is out of the way or if you’re running it in a street car it’s a good theft deterrent. Especially, when you add a hub lock. 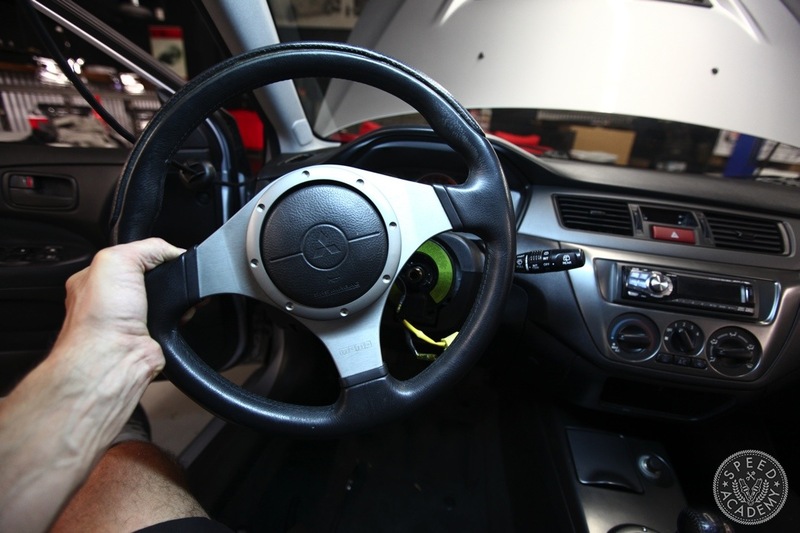 Before installing an aftermarket wheel, ask yourself if you’re willing to lose functions such as radio, cruise, and cellphone communication because a lot of the newer cars have these mounted on the wheel and by removing it you’ll be disabling them. On the other hand, if you’ve got an older (and simpler) automobile then there’s nothing to worry about! 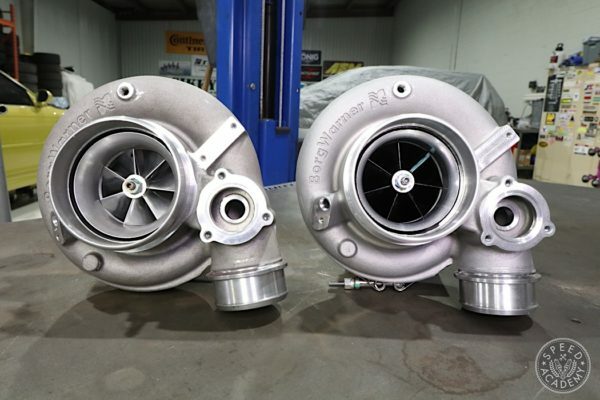 For the purposes of this story, I’ll be installing an aftermarket Personal Grinta Suede 350MM purchased from ASPEC and a Works Bell quick release hub into a 2003 Mitsubishi Evolution VIII. 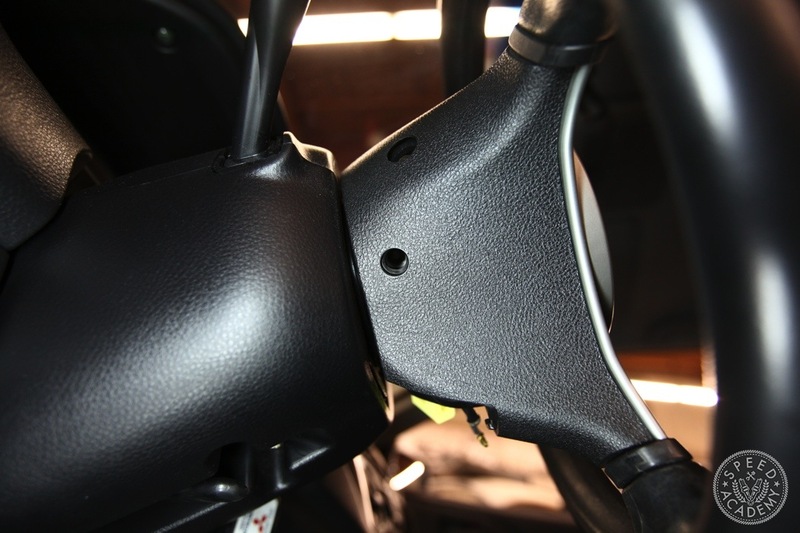 However, most aftermarket steering wheel installs will have a similar procedure to this. 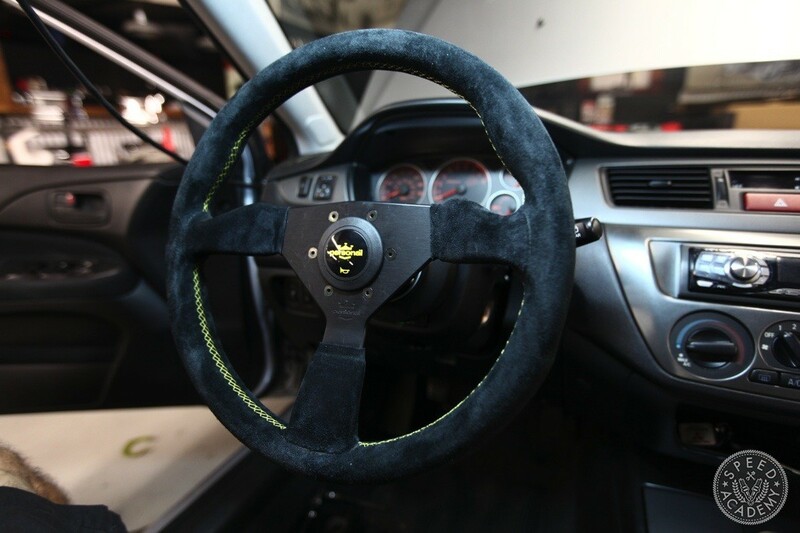 I actually don’t mind the factory steering wheel in the Evo but I wanted to have the steering wheel closer to me for better control and operation at the track. Usually you have to move the seat up to get your arms at the optimal angle for track driving but that cramps my legs and body. 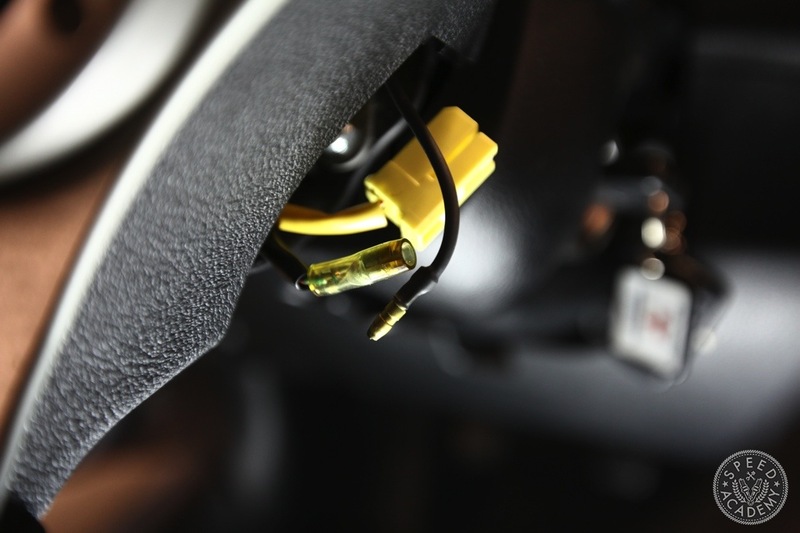 By adding a hub it brings the wheels closer without affecting driver comfort. 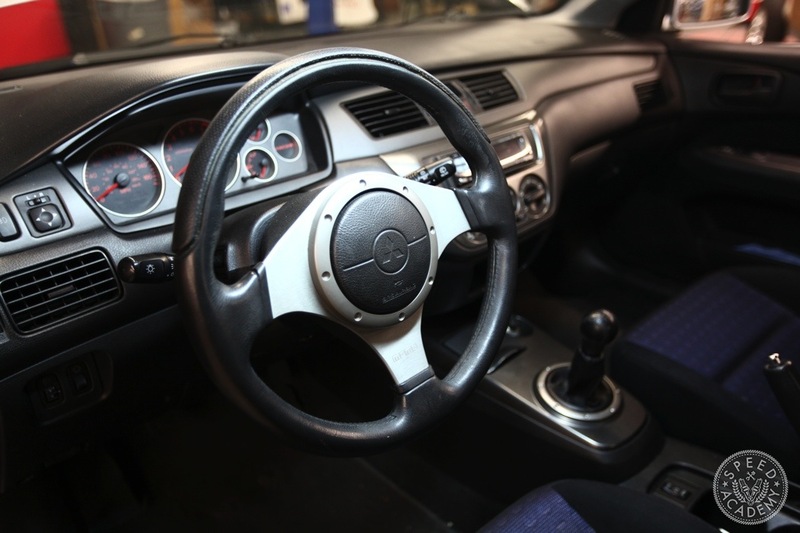 To remove the Evo’s steering wheel is actually quite simple but before you touch anything on the wheel disconnect the battery. I usually remove both terminals when I’m working around airbags. With that out of the way, pop the plastic trim off the side of the steering wheel. 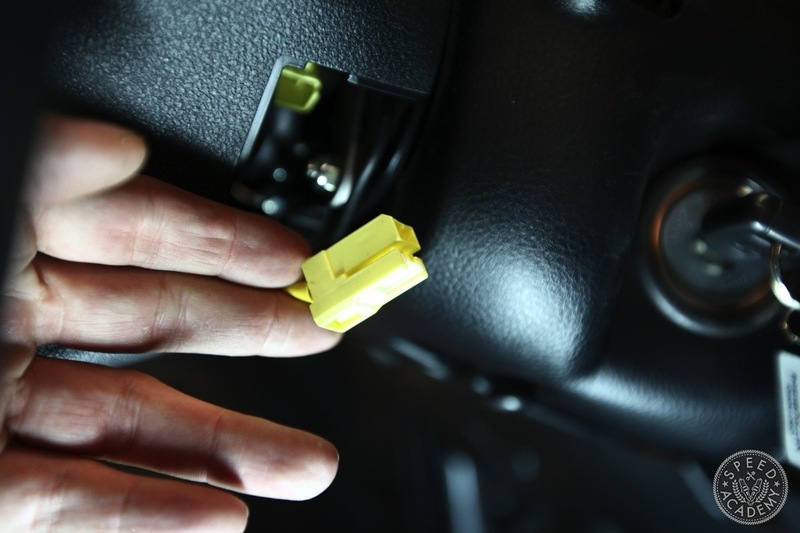 Unplug the yellow connector, it’s kinda tight so if you’ve got big fat fingers then some pliers may help here. You’ll also notice a thick black wire (it’s for the horn) that has round male/female terminals, disconnect them. Have a look underneath the wheel, at the base of it and you’ll find a hole in the plastic. You’re going to need an extended allen socket to get up inside and crack the bolt free. 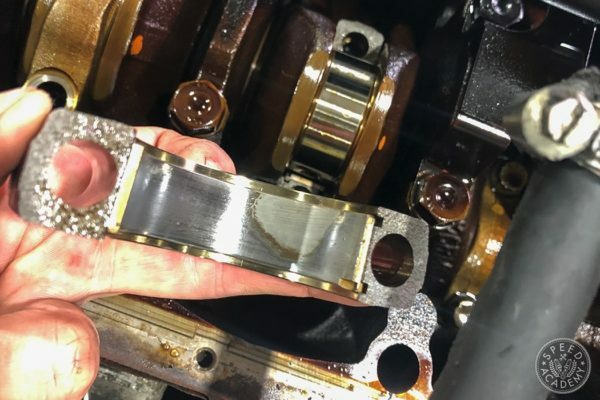 You can use an allen key and some vice-grip pliers but I warn you that the torque needed to crack this bolt is high so be careful because if the allen key/vice grips combo gives, it can go flying and do some damage. This, on the other hand is the preferred and rather non-eventful method of cracking the hex bolt free. Now, wiggle, pull, and tug until the steering wheel comes off. Mine literally popped off with the slightest tug so I’m hoping yours will too. 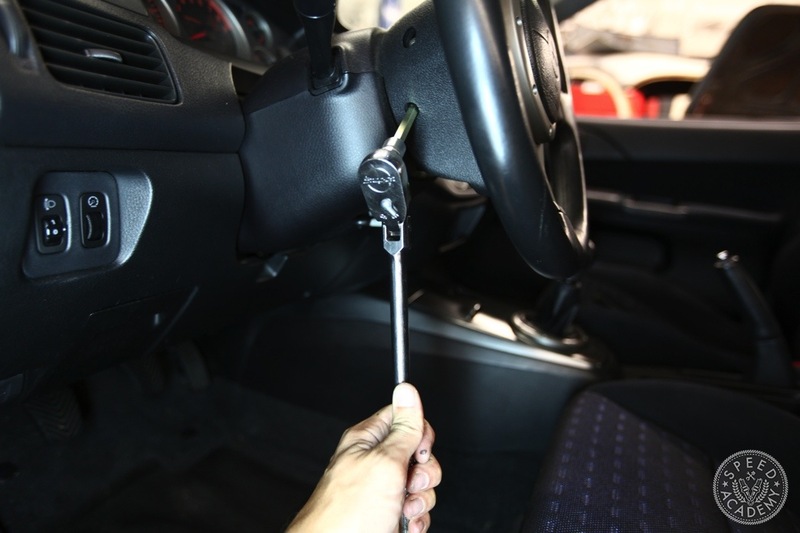 It really depends on the vehicle and what kind of fastening method the OEM used. Some definitely need a lot more pulling and yanking then others. 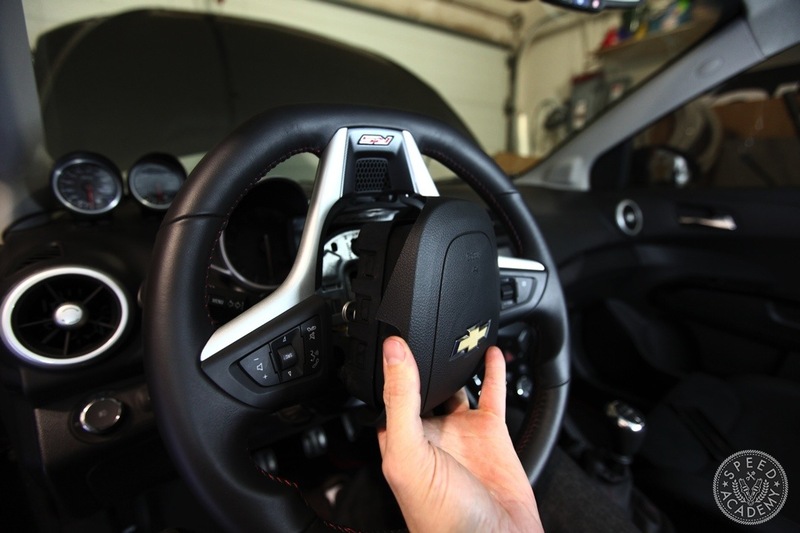 Case in point, here’s a 2013 Chevy Sonic and it has a more traditional mounting setup that requires removal of the air bag. 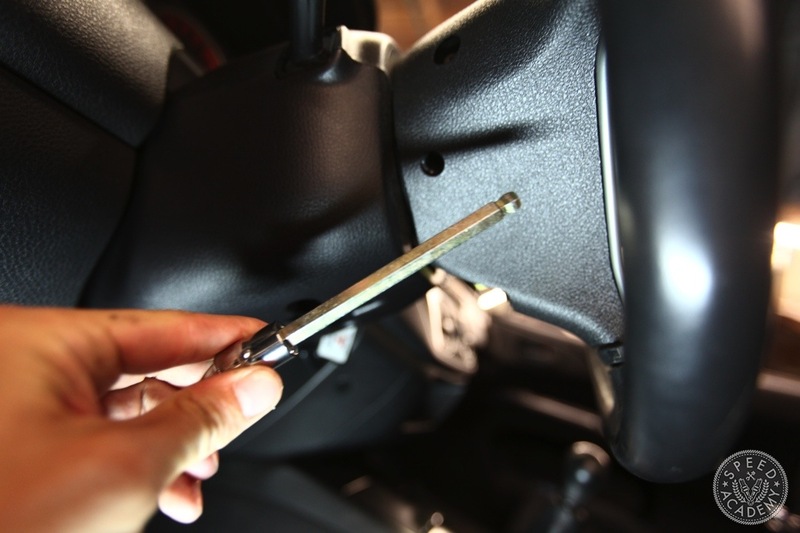 Specially bolts are often used to hold it in but the bit can be purchased at most auto parts stores. 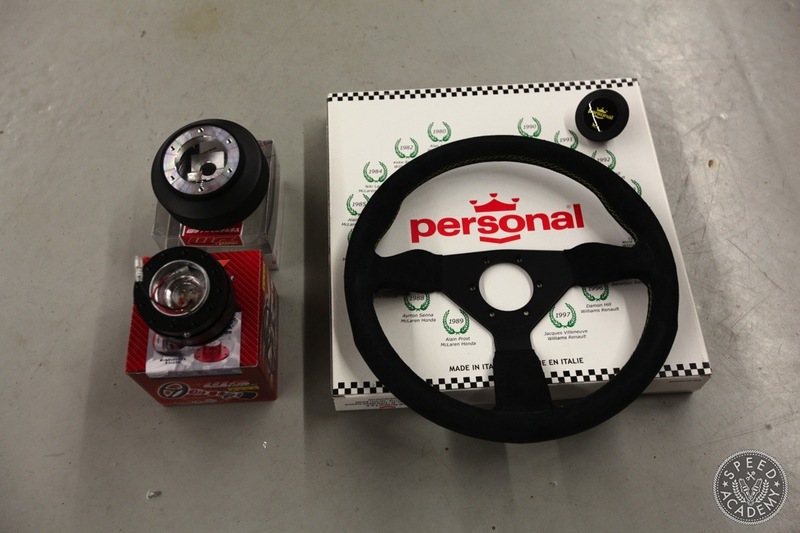 4 Comments on "Aftermarket Steering Wheel Install"
This is going to be really handy for my son. 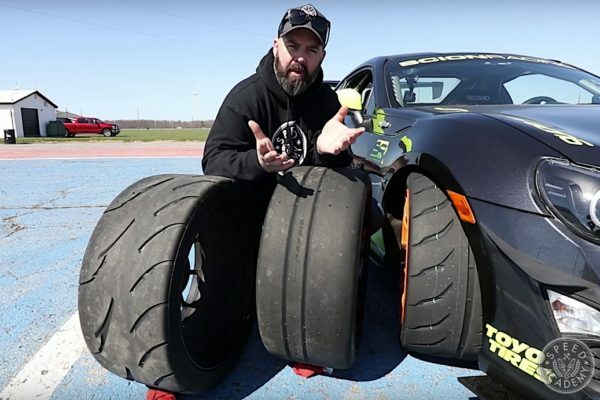 He is adding a lot of aftermarket parts to his new car. 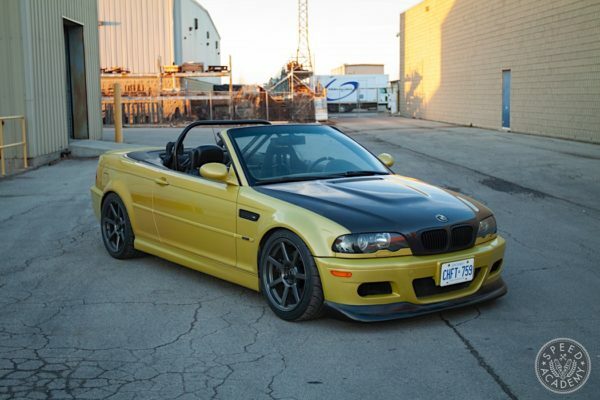 He wants it to perform as well as it can, so he is upgrading a lot of things. This includes the steering wheel, which he may be adding just because it looks cool. Right now he is shopping for the parts, then he can start installing them. I have been trying to find him information like this to make sure it gets done right. I consider myself a pretty cool mom right now. Where can I get this exact set up? Evasive Motorsports stocks all this or check out ASPEC they are the official distributors for this. Tell em we sent you!